In 2011, when Nevin and Kara Fenske opened their award-winning food truck, Drift, they had a hard time getting officials at City Hall to understand the concept. At the time, Drift was a pioneer as one of only a half-dozen food trucks in Edmonton. By 2016, there were 92 registered in the city (not including food carts and trailers). Numbers suggest that was the year the culinary phenomenon peaked in the capital. 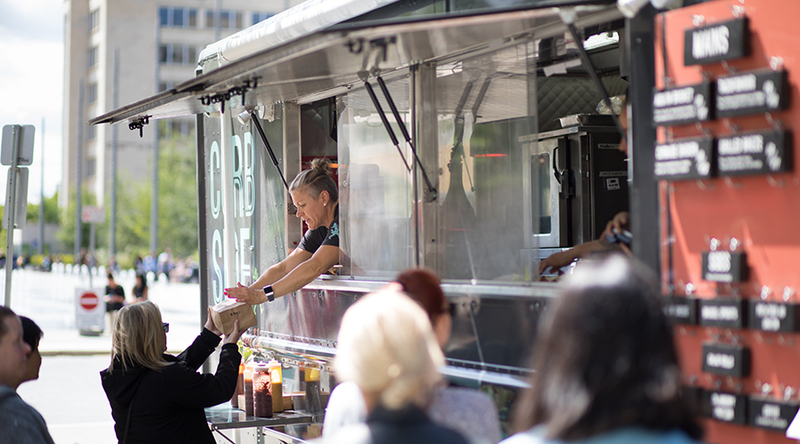 While city administrators have made the road from concept to operation smoother for food truck operators, constant competition and a changing market have added bumps along the way, says Nevin. The total food truck count dropped to 53 in 2017, and 43 as of June 2018, according to the City of Edmonton. It’s premature to say the food truck scene is past its prime, but current and former operators agree it has changed. “It’s easy to get lost in the shuffle,” says Nevin. Even if there are fewer trucks, high turnover means a steady stream of choices for consumers. The question is: how many of those trucks will return after the long and profit-limiting Edmonton winter? As the Fenskes have shown, that depends largely on how truck operators spend the hours that they’re not battling it out for lunch money on city streets. Food truck numbers in reverse? Glenn Alexander, who oversees the city’s street vending program, says he thinks last year’s decline in the number of food trucks may be an anomaly rather than a trend. “We get a lot of inquiries; we have a lot of interest,” he says. He feels it’s too soon to tell if this year’s final numbers will continue to drop. Nonetheless, many of the operators active in 2016 have disappeared or moved on to other ventures. “You don’t see the street-vending as much as you used to,” says Diane Lee, an adminstative staff member in the JR Shaw School of Business and an organizer for What the Truck. Since its launch in 2011, What the Truck has promoted local food truck culture on its website and by organizing food truck events. Operators can become members of the group for $50 a year, giving them a listing on their website and the opportunity to be included in their events. What the Truck scaled back from five smaller food truck events in 2016 to two larger ones in 2017, says Lee. Three events are planned for this year, each with 15 to 20 trucks. Membership has dropped to about 55 trucks and trailers, about 20 fewer than last year. But Lee says this may mean new operators are not contacting What the Truck. 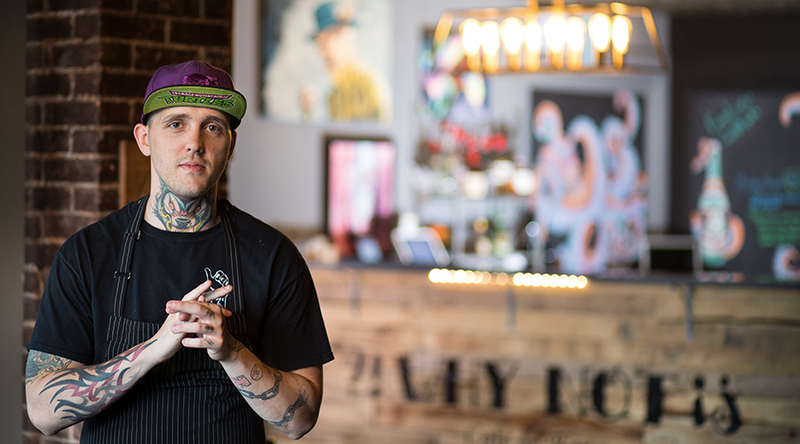 Levi Biddlecombe (Culinary Arts ’11, above) is among the operators who’ve left the food truck community. He sold his popular Attila the HUNgry truck in October 2016 after three seasons on Edmonton streets. "It’s kind of like cupcakes. They were the biggest thing and now people have moved on to donuts." Despite the decline, Lee believes the food truck community is stabilizing. “We’re starting to see some new trucks come in to replace those, so it seems fairly healthy in that sense,” she says. The reason for that good health lies partly in the way she sees that the business is diversifying. Truck operators are growing interested in finding ways to be less beholden to the lunchtime crowds, instead seeking out more reliable markets. “Someone once told me, you’ve always got to be ahead of the guy who doesn’t exist yet,” says Nevin, whose truck can still be found on Edmonton streets during the summer. Staying ahead also means being choosey. They prefer corporate or private events, where they are paid to provide a set number of meals, to events such as festivals where sales depend on weather, attendance and competition. “It’s a short season so you really have to be focused on getting into those right gigs and doing volume,” Nevin says. During winter months, the Fenskes hole up at the Shamrock Curling Club, where they run the concession and cater private functions. In the summer, the Shamrock is their commissary kitchen. Despite the challenges, food trucks are still enticing Edmonton chefs. Todd Rutter opened the Curbside truck with chefs Kim Szalinski (Culinary Arts ’00) and Mich de Laive (Culinary Arts ’99). The trio may be late to the game but bring a wealth of experience and resources from their other business, A Cappella Catering. 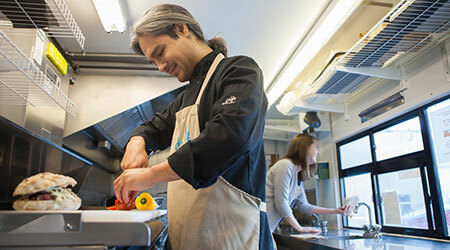 For Rutter, the food truck is an opportunity to build brand and revamp the image of his 27-year-old catering company. “It makes us look and feel like we’re the cool kids, too,” he says. It also keeps them competitive in a catering market where food trucks are now serving private events. But, in and of itself, a food truck is not a guaranteed means of growth. Nevertheless, food trucks seem to be keeping both owners and consumers coming back for more. Rutters currently sees little measurable return but – like the many trucks that have come before him –still sees a great opportunity in Edmonton. He plans to run Curbside downtown for breakfast and lunch for as long as possible – potentially even year-round.